The gorgeous maternity dress. A pretty and stylish maxi maternity wear dress that will last you throughout your pregnancy. The Strapless Maxi Maternity Dress is a floor-length maxi strapless dress with a front bodice tie detail. Available in an eye-catching colour palette in a soft, lightweight fabric. 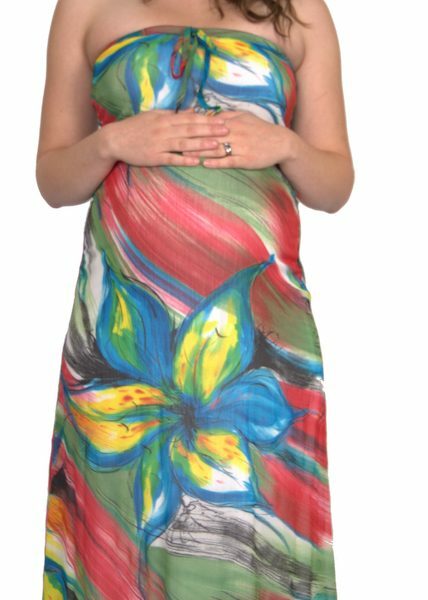 The Strapless Maxi Maternity Dress is the ideal maternity clothing dress for those barbecues at friends’, shopping on the weekend, an event or a wedding. Be stylish and feel beautiful in your Strapless Maxi Maternity Dress from Ljb Maternity. Style Options: Keep it a simple style with flats and silver earings. Then pair it with a lightweight cardigan and a tote for a casual maternity wear look. To dress it up for a wedding for function wear it with some wedges or heels, a statement clutch and gorgeous jewellery. Made in Polyester: Hand wash separately in cold water. Do not soak, bleach or wring. Dry without delay away from direct sunlight or heat. Do not tumble dry. Cool iron. Dry cleanable.